The main aim of this chapter is to provide an overview of the technical and economical characteristics of biodiesel production plants. A literature review of various techno-economic feasibility studies of biodiesel production is conducted. Moreover, outcomes of these evaluations are reported to present potential commerciality and near-term technical viability of biodiesel plants from different regions. 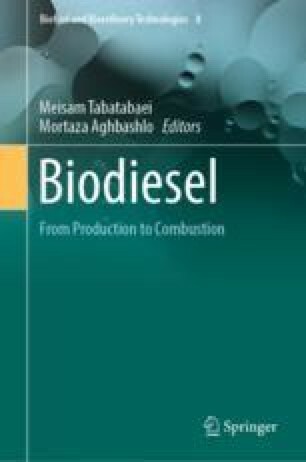 In this chapter, various technological possibilities and economic aspects involved in the production of biodiesel are outlined. Significant effort is made to ensure that common assumptions are used as the basis for the comparison among conversion technologies. In addition, this analysis constitutes of the input feedstock needed, environmental considerations, energy balances, and detailed economic assessment including the cost component structures for biodiesel. Conclusions made in this study are merely indicative of the expected performance of biodiesel production plants based on the current state of public knowledge. These findings can aid in conducting significant comparisons between different technologies for producing biodiesel and exploring scenarios with optimal biodiesel production configurations.